Dynamic loads are common in the operating environments of many optical applications. Loads such as imbalances in rotating machinery, nearby road traffic, and ambient airborne vibrations can all cause measureable degredation in optical performance. 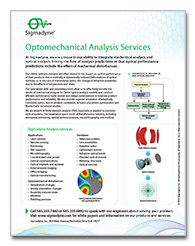 Sigmadyne is prepared to predict these dynamic behaviors in your products and to help you develop a design to meet your requirements. Our vibration analysis capabilities were used extensively for the Omega Laser Bay upgrade at the University of Rochester Laboratory for Laser Energetics where energy research is conducted. For this application it is critical that each of the 60 laser beams is accurately pointed and focused on a deuterium filled bead less than 1 mm in diameter suspended in the target chamber. This requires that all of the structures supporting the many optics which control the laser maintain their precise alignment. One of the factors which affects this alignment is the vibration of the concrete slab on which all of the optical support structures are mounted. These vibrations are caused by overhead air traffic, automobile traffic on a nearby highway, and building HVAC equipment. Figure 1 shows a finite element model of one of of the six Final Alignment Sensor Packages. This model was used to conduct a forced response analysis to verify the dynamic stability of the ten beam paths through each cell in the structure. Figure 1: A finite element model of one of the Final Sensor Alignment Packages was used to predict dynamic stability of the beam paths as affected by ambient vibrations in the supporting slab. Courtesy of University of Rochester Laboratory for Laser Energetics. 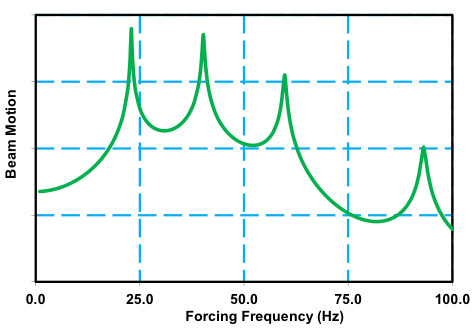 Figure 2 shows an example frequency response function of one of the beam paths. Figure 2: Frequency response function of beam motion on target.